Studied at Blackpool and the Fylde College from 1986 until 1991. Subjects: BTEC National Diploma in Design - Technical Illustration and BTEC Higher National Diploma in Design - Scientific Illustration. For the past decade, David has worked in the field of design, from Graphics, Illustration, Packaging and Web Design. Early in his career, David produced Airbrush Illustrations for the Golden Mile's attractions, including the Hot Ice Shows, Peter Jay's Circus and Mystique. David is becoming renowned for his guest speaking, demonstrations and master classes at many Art Societies on the Fylde coast. 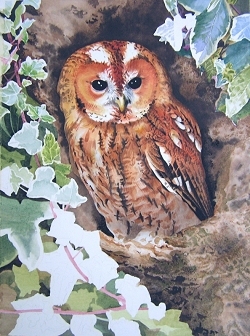 For 2007, David is launching his art in a big way with the introduction of penningtonART.co.uk. 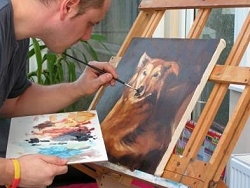 Although his success to date has been with his Pet Portraits, David also tackles an array of other subject matter. David Pennington has been down to Turbary Woods and spent the day photographing our birds and in return he painted and gave me this original watercolour of Knowley.